Matt’s visits to China have brought us some new perspective on the massive economic shifts in China. A recent photo he took attempted to show a multi-acre, $2 billion expanse of new solar panels, unsuccessfully–it stretches out to forever. Another showed a coal plant bigger than anything I’d ever imagined. In China there are no zoning issues, and they are agnostic about how they generate enough power to run the country. Relocate over a million people to build the world’s largest dam? Sure, why not? “I’d rather cry in the back your BMW than laugh on the back of your bicycle.” I suspect this is not a formula for lifelong happiness. 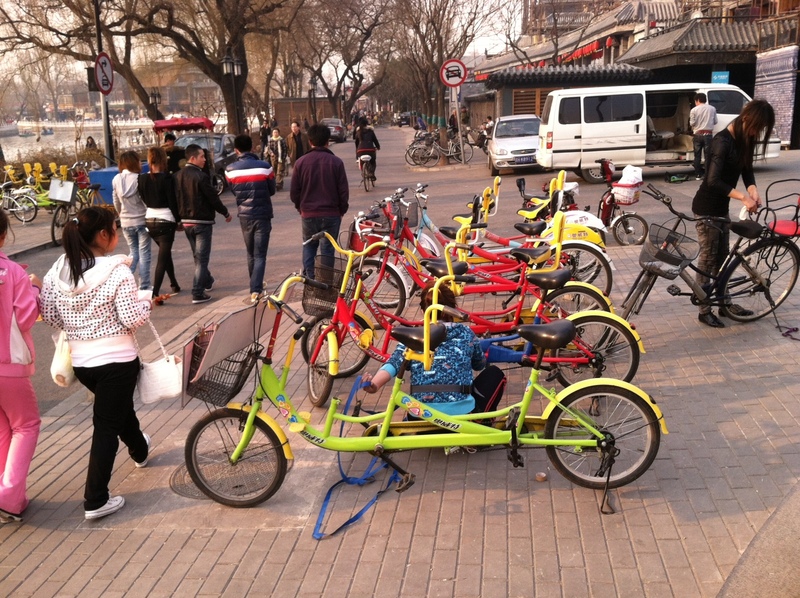 China had, at one point, a very deep bicycle culture, but it is fading in the face of the perception that cars are more prestigious. A couple of newspaper articles Matt brought back suggested that there was increasing awareness that a large-scale transportation shift from bicycles to cars was unsustainable in China, if only for its likely effects on traffic. In the meantime, for many people riding electric bikes seems to be at least a short-term compromise. 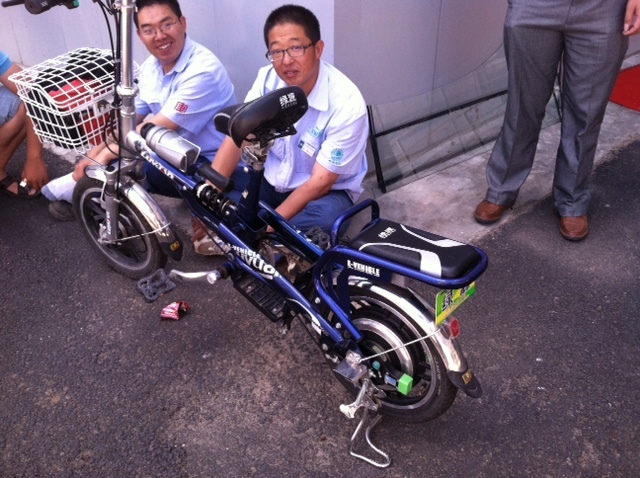 One of Matt’s colleagues uses this electric bike to commute and ride around the organizational campus in Beijing. 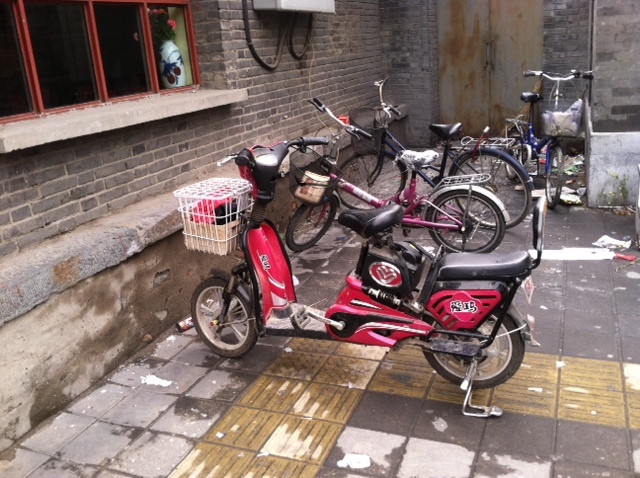 Like all bikes Matt’s seen in China, this one has a generous cargo basket and an extra passenger seat. 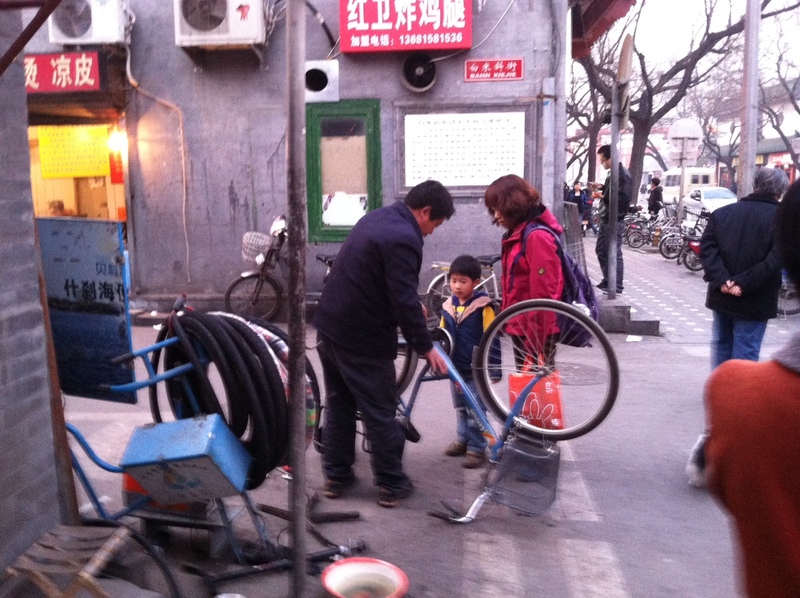 China is not exactly cutting-edge in the area of interesting family bikes, for the fairly obvious reason that families have one child apiece and a single child can be managed on almost any bike. However the back seat could be used either for carrying a child or a less-material adult. 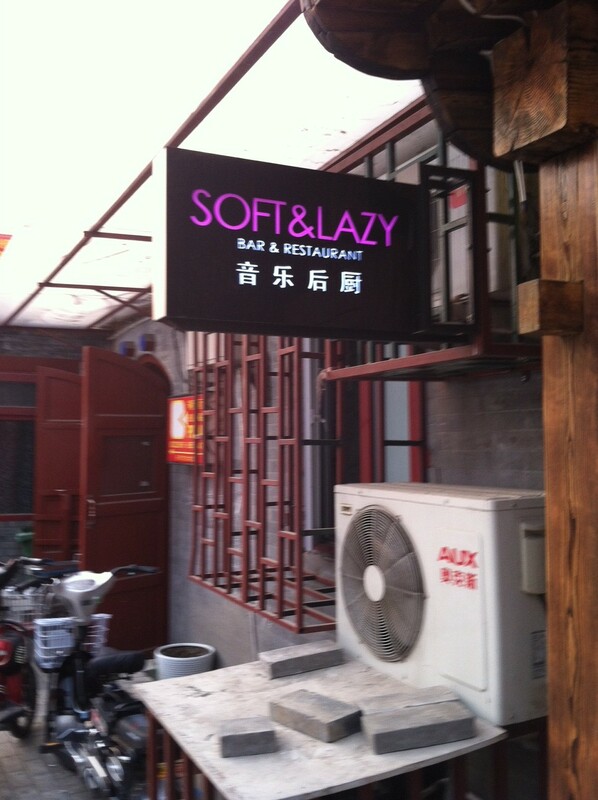 This sign was posted outside Matt’s hotel in Beijing. 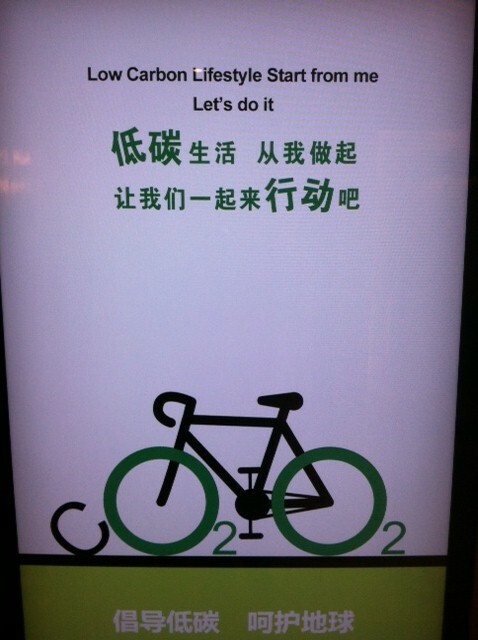 In the long term, if the government of China wants everyone to ride bicycles, that’s probably exactly what will happen. I have no idea whether this is any kind of national priority. It’s clear that alternative transportation is not a national priority in the US. However the advantage of living in a democracy is that change can spread from the bottom up. 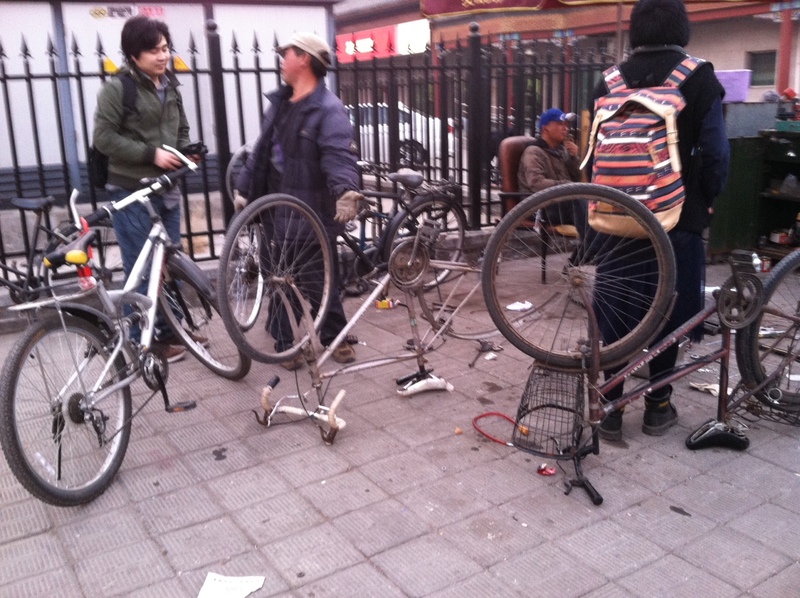 Matt is in China, and that can only mean it’s time for another update of bicycles in Beijing. 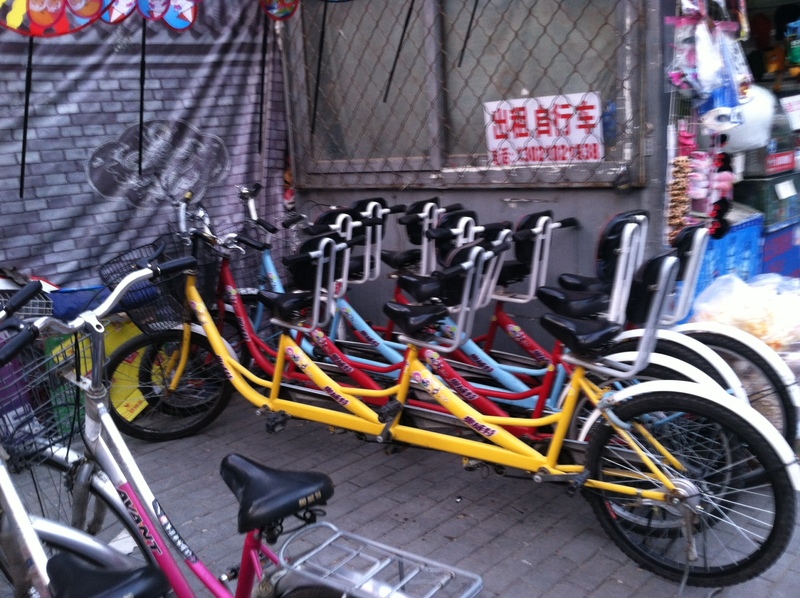 Last time Matt went to the tourist bicycle center of Beijing and caught some righteous triple tandems. This trip’s theme is practical bicycles spotted on the road. These seem to involve two things: electric assists and passengers. 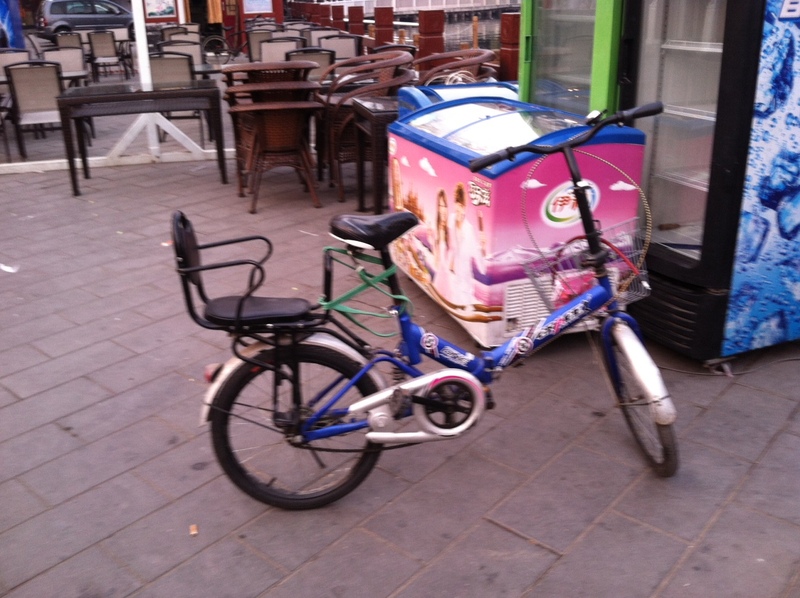 There is a wide range of electric bicycles, and while some of them are primarily for occasional assistance up the hills, in Beijing the bicycle part seems like the afterthought. This bike has pedals, but it’s moving more toward a scooter aesthetic. And those giant batteries have to be sealed lead acid, an environmental disaster. Going even further along the spectrum is this bike, which looks more like a moped than a bike, although those pedals do seem to turn, I presume for legal reasons. 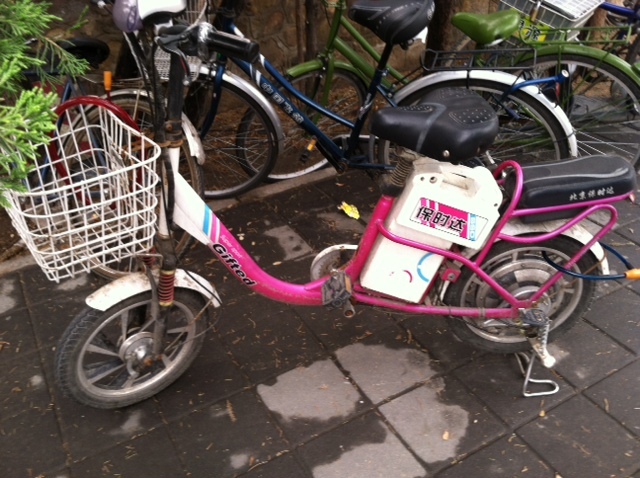 But credit where it’s due: this bike, like the other, can carry a passenger and has a dedicated front basket. These are not the overpowered machines lacking space for even a briefcase that litter San Francisco sidewalks. They’re meant to haul, not to look cute, and I’m guessing they’re a lot cheaper than the Vespas parked next door to us. 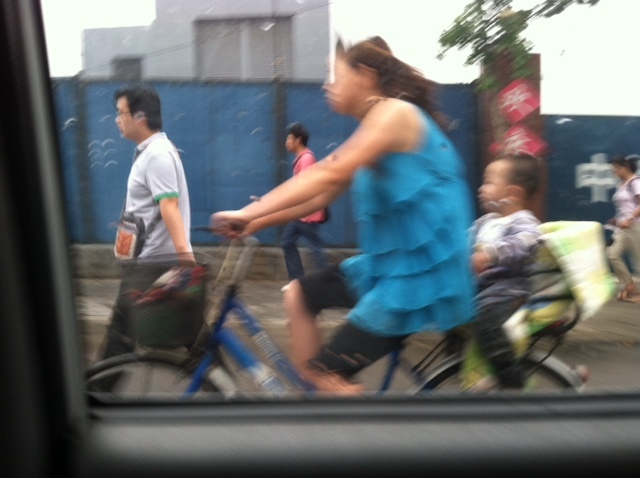 And in Beijing, evidently, it’s normal to carry even older kids on the back of the bike. I sometimes regret that our kids will be on our bikes for so long, which reflects the traffic and hills of San Francisco, but I’m beginning to think that this is inevitable for people living in a city that doesn’t have extensive bicycle infrastructure (e.g. Amsterdam, Copenhagen, Tokyo). Sure, it would be better if our kids had more independence, but you have to work with what you’ve got. These moms make me think that the fears of riding in traffic are relative. 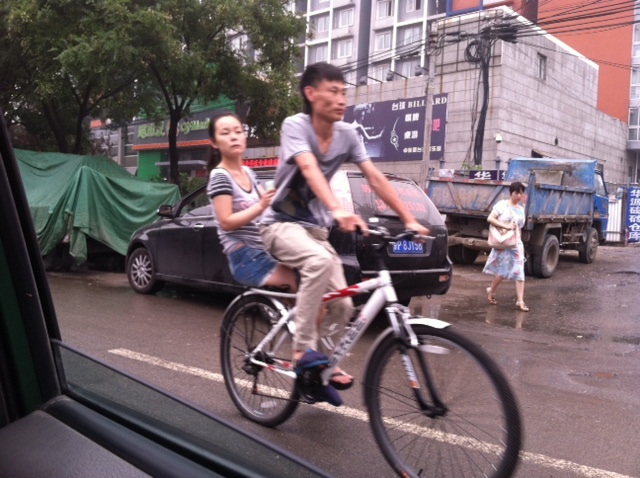 I’ve gotten more confident riding in city traffic here, but riding in Beijing would probably give me a heart attack. And parents from smaller cities would probably have heart attacks here. We get used to the circumstances around us. It’s not like kids have never died in cars. 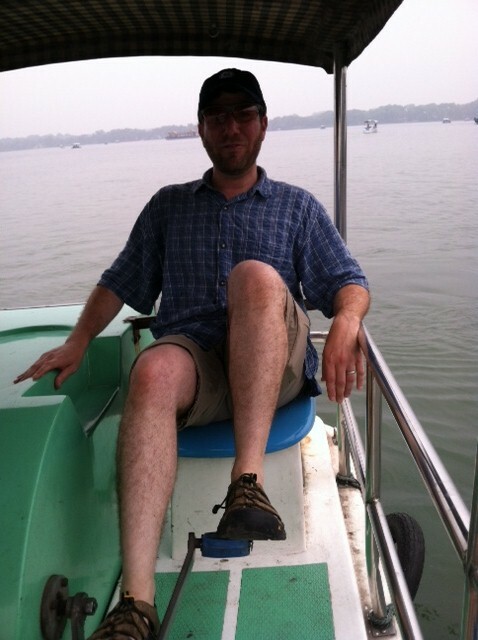 Pedaling a paddleboat is a kind of pedaling. 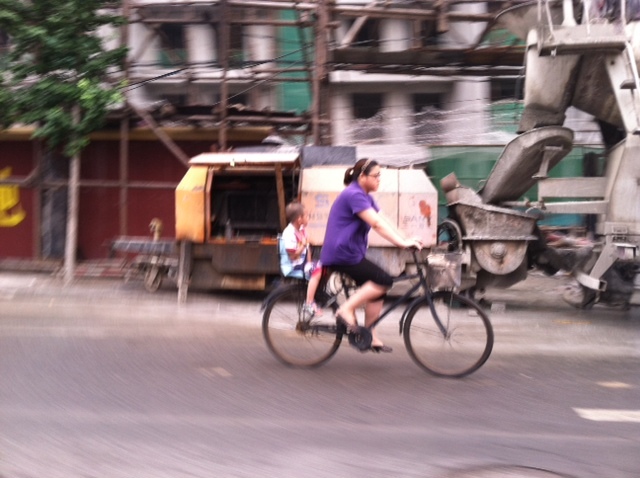 Matt still has yet to ride a bicycle in Beijing. But at least this time he’s pedaling.